Ki Aikido and Kiatsu. Kunio Okajima began to study the spirit of unity of mind and body, Aikido, and Kiatsu Treatment under Koichi Tohei Sensei at Tokyo Headquarters of Ki no Kenkyukai (Ki Society) in 1976 and became teacher of Shinshintouitsu (unity of mind and body) Aikido and an assistant instructor of Shinshintouitsu at the headquarters. 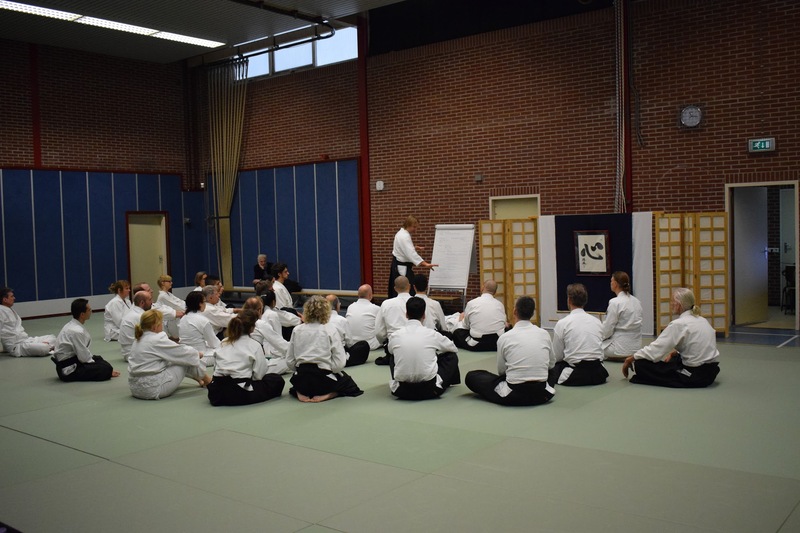 Aikido Yuishinkai. In 2005 Okajima sensei opened the Aikido Yuishinkai Kansai districts Headquarter of Aikido Yuishinkai and became the representative general manager. He was given the 10th dan by Master Koretoshi Maruyama in 2010. Daito-ryu: In 1987 he began to study Daitou-ryu under Seigou Okamoto Sensei at Daitou- ryu Aiki Jyujitsu Roppoukai. He became the head of Daitou Ryu Aiki Jyujitsu Roppoukai Osaka Dojo in 1987, and in 1988 the general manager of Kansai Districts Branch Office. Nouryoku Kaihatsu (capacity building) Kenkyusho under Susumu Hibino. Goshindo. While studying the above, he came in contact with Goshindou and subsequently opened Nihon Goshindou Kansai Branch Office in Osaka in 1994. This became the Nihon Goshindou Kansai Districts Headquarter of which he became the representative teacher in 1997, in 2002 the standing director, and in 2006 the executive director of Nihon Goshindo Kyoukai. In 2012, he became the president of Nihon Goshindo Kyoukai. Reiki: In 1997 Okajima sensei studied Reiki under Hiroshi Doi at Gendai Reiki Healing Kyoukai, and became a Reiki master in 1998. Gendai Reiki Healing Kyoukai recognized him officially as the 7th authorized Reiki therapist under the direct guidance of Hiroshi Doi in 1999. Now, he is the representative director of Gendai Reiki Healing Center. Soutai-ho. In 2000 Okajima sensei became also a teacher of Soutai-do and in 2001 an instructor at Soutai-do Fukyu Tomono-kai and the representative of its Osaka Central Branch. He established Kansai Soutai Balance Undo Kenkyukai (2003), changed the name to Soutai Balance Kyoukai in 2007, and became the president of it.